Many people are content sharing their ideas by teaching lessons or masterclasses. What was your driving force for taking on such a large project as writing a book? I have been planning to write a book for several years; it has been a long-term goal of mine. I finally decided it was time and I just sat down and did it. I had to keep regular hours of writing and give myself goals to finally finish it. I imagine that students can take this book into the practice room and use it to help them figure out how to solve problems. I was going for convenient and concise because when I’m practicing, that’s what I want. Here’s the problem, what am I going to do about it? Ownership of your playing and accountability are large themes in Musician, Heal Thyself. In your own playing, when did you discover the importance of accountability to yourself? I think I learned to be accountable in college. It is not easy to work the gaps in your technique, but it is really essential. Unfortunately, there is no way to stay at the same level in one's playing. It would be nice if once we mastered something, it would always be there, but ours is a physical art and it must be maintained. I think that the first place to start, for everybody, is in the practice room. If you can be honest about what you need to work on and really, really practice with purpose, with intelligence, and with economy, you can have a dependable and enjoyable career on the horn. I have a lot going on in my work life and a lot going on in my family life too, so I really don’t have time to waste in the practice room. There is a chapter in your book dedicated to injury prevention and wellness, which is not a topic often included in books about horn playing. What compelled you to write about this? A lot of people ask me that. I think as an educator, it’s really, really important to start with prevention: proper air support, posture, recognizing symptoms of overuse, and knowing where to go for help. Practice with economy, and don’t abuse your body. The first time you have pain, stop. Reevaluate what you’re doing. Stay in shape. Take care of your body. I think musical wellness should be part of every performance curriculum, and I hope every teacher feels the same. My information in this book is very basic: pictures of the muscles (it makes sense when you look at it why certain ways of playing are kind of a bad idea) and there are other places to look. If you get into trouble or you have an injured student, the thing is to not ignore it. I think a lot of people don’t feel comfortable taking on this topic, I mean, I’m certainly not an expert. I’ve looked at the resources we do have available, and I tried to go from there. I hope everyone will think about it, and teach it. Prevention is really the key. And you provided references in the back of the book to those resources, right? Yes, I did. For every chapter of the book, I mention my favorite resources for those topics. Even after publishing the book, there are more and better resources available for understanding and treating performance injury. It ties in a lot with sports medicine, so you can always look there, there’s the Cleveland Clinic, and there’s an embouchure clinic in Spain. I would encourage everyone to look, and don’t stop with my book, especially if this is something that interests you. Go, read! There’s lots of stuff available. You focus a chapter of your book on audition preparation. Isn’t getting ready for an audition just more intense practicing? (laughs) No, it isn’t. Actually, I had to learn that by experiencing some failures in auditions, looking around and thinking, I’m going to graduate soon and I need a job. What am I going to do about this? Desperation has always been a great motivator for me. I looked around and I thought, These people are winning jobs. What’s their secret? I went and asked them, ‘How’d you win your job?’ And they told me! When you ask players who have had audition success, they’re very happy to share their story. It’s not really magic; good planning wins auditions. It wins orchestral auditions and it wins solo competitions. Most often, the person who wins the job is simply the most prepared person who showed up that day. When you look at my plan, I have it in three phases, and the third phase is only mock auditions. I advocate a written plan where you chart your course, you pick what you could do better in your excerpts, and you make a plan each day how you’re going to work out exactly that. It’s focused, it’s directed, and it’s very empowering walking into an audition knowing that you really, really know your material. In one section of your book, you include a list of exercises and drills for air, strengthening, endurance, articulations, lip trills, low register, high register, and register breaks. Do you care to give a sneak peek of your favorite exercise for your own practicing? I love them all, actually that’s why I put them in there. Those are my favorite ways to practice those particular areas. I guess my favorite one is the lip trill. I like that one a lot. It’s useful in maintaining flexibility and in the extreme high register helps to make sure that my articulations are nice and crisp and that I’m using air at the front of notes. It’s been really useful, so that’s probably my favorite one. 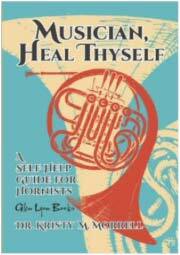 How long did it take you to complete Musician, Heal Thyself? It took a really long time, and most of these chapters have to do with what I’ve been teaching for the past, at least, 15 years. The bigger chapters on Performance Anxiety, Musical Wellness, and the Warm Up are things we talk about in masterclass. The Warm Up chapter I wrote in the way that I did because the truth is, every student has a different warm up. I remember I got an email from someone saying, ‘I’m writing a dissertation on warm up, could you send me yours?’ I sent him my outline of a warm up, which includes all these different categories, because I don’t believe that one warm up is going to be right for every single person. My own warm up is always different. As my needs change, as I have this or that coming up on the next concert, maybe I’m playing a lot this week, or maybe I’m not playing very much, I adjust my fundamentals routine accordingly. I needed to put that down in the book. The idea is you can take those exercises and plug them in, or write your own! I left space at the end of all of these things because people should use their imagination. Write things down and decide What’s best for me? What do I have coming up? What am I struggling with? What are the elements of my playing that I really need to work on? The point is: it starts with you deciding here is what I need to do and here are my choices so that you can find your own answers, which are really the best ones. Some of the musicians you studied with throughout your education include Verne Reynolds, James Decker, and Vincent DeRosa. What influence did they have on your teaching? My two biggest influences in my teaching would definitely be Verne Reynolds and Vince DeRosa. I was fortunate enough here [at USC] to spend five years with Mr. DeRosa, which was a very long time with one instructor, but honestly we did a lot of good work together. My time at Eastman with Mr. Reynolds was invaluable, absolutely invaluable. I think Mr. Reynolds taught me the importance of dailiness and about thinking things through first: what is this (when you’re looking at an etude), how do you decode this, what’s the subdivision, what is he after, what’s the interval? Then basically start slowly and work at it incrementally every day. Verne was a thinker, and I always liked that about him. I would ask him a question and he would say ‘You know, that’s a great question. How are you going to find the answer to that?’, and I would say ‘Well, I’m not sure’. He would say, ‘You know there’s this huge library right across the street, so next week why don’t you come back and tell me what you found out?’ At the time I thought that was kind of frustrating, but now I look back and I think, with all that stuff I looked up and learned on my own, and all those journeys I took, I really learned from that situation. More than that, I felt like there wasn’t anything that I couldn’t figure out. Learning how to learn is huge. In retrospect, I try to teach that every day as well as Mr. Reynolds did. And Vince had this art of saying things in the simplest way. He would just distill it down to the very essence of whatever it was he was talking about. Sometimes when you’re talking to somebody who speaks very simplistically like that, you can think Well, really? but in the heat of the battle, that’s what sticks with you. That’s the kind of help for when you’re about to play that high Eb concert, and you just go breathe, breathe, ‘T’ and there it is. It’s not the time to be thinking about which partial it is. There are some really over-thinking ways of approaching the horn that, for me, didn’t work. So with Mr. DeRosa, it was really great in that he would say ‘Eh, try it a couple of different ways. If that isn’t what you like, try something else’, simple things like that, which are so true. Sometimes I would make mistakes, really big ones, and he would say ‘Well, that’s how we learn, isn’t it?’ with a big smile. There’s no reason to be anxious about it or overly concerned; that is how we learn. It’s that simple. I think in my teaching those are the kind of things I try to bring to my students. If you don’t know something, that’s great. That’s a perfect place for us to start. But I don’t really want to tell you the answer, I want to point you in a certain way. A lot of times they’ll come back with better answers than I had, and we all learn from that situation. But mostly they come back with the confidence of knowing that they can find the answers. What would you say to those of us who are stuck in a rut in the practice room? Well, that’s good that you realize it. If you are stuck in a rut in the practice room, I think a good thing to do is change up your fundamentals routine. Keep the same categories of your routine, but pick different exercises to go through. The thing that I do if I’m musically stuck in a rut (because at this point I’ve played a lot, some of the old etudes just aren’t doing it for me anymore, and some of the old solos, I don’t want to play again) is look to new music and look to repertoire for voice or other instruments. Do a little transcribing if it’s not for your instrument. I love the vocal repertoire. Honestly I think if I had a voice that I would be a singer. (laughs) I like to dress like one anyway. I don’t have a voice. I do like to sing, but it’s not very good. There are a lot of great horn players, and they inspire me, but honestly, mastery in any form is inspirational to me. Visual art, the written word, even cooking can help me to remember it is really about expression. To me, when I get into a rut, that’s where I go. Your book is also available as an iBook for Macs and iPads. What are some of the features in those versions? There are audio and video inserts to demonstrate some of the exercises. I really wanted to do the iBook version because I think that’s how a lot of college students are practicing these days. They take their iPad in and use it to play recordings and for their drone device and metronome, and I wanted to have the book right there. If they were playing out of it, they could ask ‘Is this how you really do it?’, hit the play button, and there’s me playing it for them so they can listen or watch and play it themselves. Also, the iBook version is very economical. I wanted to make this book affordable so that everybody could have it and that it’s not a huge investment. Musician, Heal Thyself is available through Glen Lyon Books, a sister company of Balquhidder Music, at www.balquhiddermusic.com/GLB1003.htm or under Morrell, Kristy M. in their catalog, and is also available as an e-book on iTunes.